I know I declared 2014 the year of the master bedroom, but I've decided to get a jump start on a few things. One of those things is window coverings. When we bought the house, terrible maroon blinds hung on the windows. Of course I took them down immediately. Since the windows are standard size, I was able to buy in-stock roman shades at Lowe's for around $25/each. I knew they weren't what I wanted long-term, but knew they would work for now. The roman shade before - boring and not-so-white anymore (sun bleached). Fast forward almost 4 years and those same roman shades are in my bedroom. I don't know if you have placed out roman shades lately, but any with a design are expensive. Regardless, I had decided to bite the bullet and pay for custom. The only problem? I couldn't find any that I liked. I ordered lots of fabric swatches but couldn't find any that I liked. After giving up I had a thought. I wondered if I could just recover the shades. With that thought in mind I headed to the fabric store and picked up a few supplies. It was a very time consuming project, but one that just about anyone could do. * I have tried my best to replicate/document the steps. Please let me know if anything doesn't quite add up and I'll try to elaborate further. I'm a little (ok, a lot) OCD about things lining up, so this is the hardest part for me. After laying the roman shades flat, lay the fabric on top and determine your center. I do this by folding over each edge and making sure the pattern cuts off on each side. Fold fabric at edges to determine if fabric is centered. I didn't have to do this step because my pattern ran in such a way that is only measured 54 inches (and I needed roughly 70 inches). I would recommend cutting it 1/2 yard longer than the fabric length when laid on top of the shade. If you are worried about wasting fabric you can wait to cut, but you will have to handle a lot of fabric during the folds - something I don't recommend. 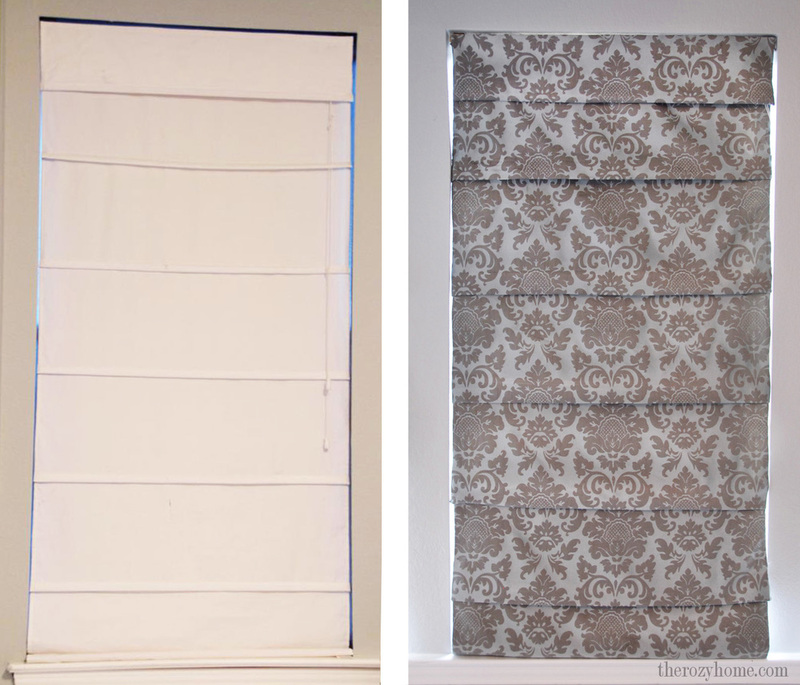 Measure a piece of hem tape to the width of the shades. Iron the tape on and remove the top layer. Measure and cut hem tape. Lay the fabric on the tape and press with an iron. **Just a note here. I have shades with a removable top piece, so I just pressed the fabric as is. If you do not have this piece, make sure you fold over the top edge of the fabric before pressing so you have clean edges (similar to how you will do the bottom hem. Refer to that section for further clarification). I'm going to try my best to describe this section. It's a bit hard to put into words. Find the dowel (the wooden bar) for the first fold of the shade. Pinch the fabric around that area. Pinch the fabric to create the fold. My shades are almost always down (the Hubs isn't a fan of early morning light) so I made my folds rather exaggerated. Once you determine the amount of fold you like, lay it flat and press it. Again, bear with me here. After you have pressed the fold, pull all of the fabric up to wear you can see the dowel. Place a piece of hem tape on the width of the dowel and press. Add tape to the dowel. Fold the fabric back over and press the fabric underneath the fold.This will attach the fabric to the roman shade. Press the fabric underneath the fold. Repeat the above steps until you reach the bottom of the shade. Turn up the bottom edge of the shade. Determine whether you want clean edges. If the shade will face a street or you are a perfectionist, you will want clean edges. To do this, fold the fabric edge over half way. Fold again. Press the fabric. Attach a piece of hem tape on the bottom dowel and press fabric. Press folded over press to create bond with hem tape. Turn the roman shade over so the fabric is laying face down. Fold the side edge as you did the bottom. Attach a piece of hem tape on the side edge and press fabric to create a bond. I have found that doing one side and one section at a time is much easier. That's it! Like I said earlier, it's very easy to do but time consuming. It took me about 2 hours per shade, but that's thanks to me being a Type A kind of gal. I also had to stop and take pics after each step, so that added a little bit of time. Realistically, it should take about an hour to an hour and a half. So what are you waiting for.... go cover those old, faded shades in your home!